Teaching your dog to relax in a crate is an effective way of ensuring its safety while protecting your home and possessions from damage caused by chewing or other destructive behaviors. Other information on reasons and advantages of crate training can be found in our handout 'Crate Training in Dogs'. This handout is intended to give you tips to successfully train your dog to accept crate confinement. Most dogs quickly choose a small area, such as a corner of a room, in a dog bed, or on or under a couch, where they go to relax. If your puppy has just recently been adopted from the breeder, kennel or pet store, crate training should be relatively easy, since your puppy is likely already accustomed to sleeping in a pen or crate. The key to making the crate the dog's favorite retreat and sleeping area is to associate the crate with as many positive and relaxing experiences and stimuli as possible (treats, chew toys, bedding). 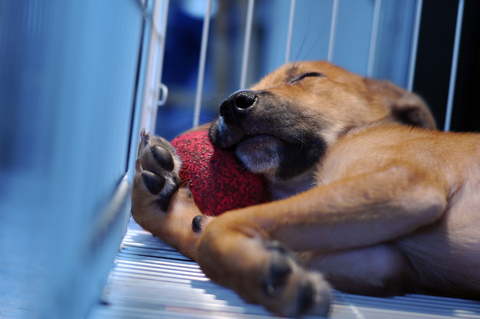 Place the dog in its cage when playing with new toys, during scheduled rest and sleep periods or even during feeding. You must plan and be aware of the dog's schedule, including its needs for exploration, play, food, and elimination, so that the dog is only placed in its cage after each of these needs is fulfilled. You must then return to the dog to release it from its cage before the next exercise, feeding or elimination period is due. A radio or television playing in the background may help to calm the dog when it is alone in its cage, especially during the daytime. These may also help to mask environmental noises that can stimulate the dog to vocalize. The crate should not be used for punishment. There is also some evidence to support the use of a pheromone spray on the dog's blanket or a pheromone diffuser in the confinement area to help the dog adapt. Introduce the puppy to the crate as soon as it is brought home and as early in the day as possible. Place a variety of treats in the cage throughout the day so that the puppy is encouraged to enter voluntarily. Bedding, toys and water can also be offered to the puppy in the open cage. Food might be placed in the pen or crate if you wish to also designate it as a feeding area. Choose a location outdoors for the puppy to eliminate. Take the puppy to the location, wait until the puppy eliminates, and reward the puppy lavishly with praise or food. After some additional play and exercise, and when you feel its time for your puppy to take a nap (or when you see your puppy begin to settle down for nap), place the puppy in its crate with water, a toy and a treat, and close the door. If the puppy is tired and calm, it may take a "nap" shortly after being placed in its crate. If not, be certain to provide a few novel and stimulating toys or chews for play. In this way the crate serves two functions - as your puppy's bed (crib) or your puppy's play area (playpen). Leave the room but remain close enough to hear the puppy. Escape behavior and vocalization are to be expected when a dog is first placed into its crate. If the "complaints" are short or mild, ignore your puppy until the crying stops. Never release the puppy unless it is quiet. This teaches that quiet behavior, and not crying will be rewarded. Release the puppy after a few minutes of quiet or a short nap. A brief disruption may be useful to deter crying if it does not subside on its own. A shaker can (a sealed can filled with coins or marbles) can be tossed at the crate when the pup barks. Other methods include water sprayers or alarms (audible or ultrasonic). The owner should remain out of sight when using these disruptions. By plugging in an alarm, tape recorder, or hair dryer beside the crate and turning it on with a remote control switch each time the dog barks, the dog can be taught that barking has unpleasant consequences whether the owner is present or not. When the barking ceases, the disruption is stopped. Bark collars and alarms that are activated by the barking are also available for persistent problems. These latter techniques must be used with caution, since it can exacerbate the vocalization problem of a very anxious pet. 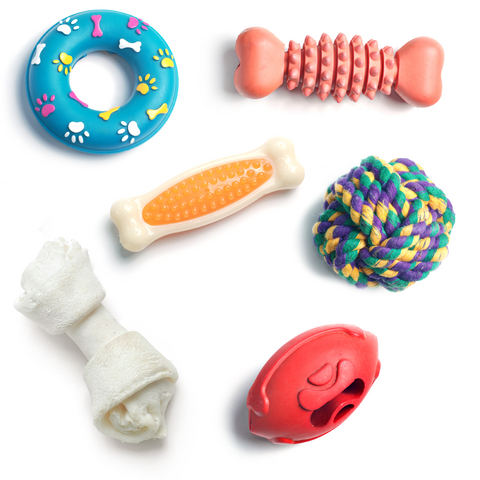 Repeat the cage and release procedure a few more times during the day, at each naptime and each time your puppy is given a toy or chew with which to play. Each time, increase the time that the dog must stay in the crate before letting it out. Always give the puppy exercise and a chance to eliminate before securing it in the crate. At bedtime, the dog should be exercised, secured in its crate, and left for the night. Do not go to the dog if it cries. Remote punishment can be used to deter crying. You might choose to leave the crate in the same place as it has been during the day, or you might move it to the bedroom (or a second crate could be used). If the pup sleeps in one end of its crate and eliminates in the other, install a divider to keep the puppy in a smaller area, as long as you do not leave it in the crate for long periods. Never leave the puppy in its crate for longer than it can control its bowels or bladder or it may be forced to eliminate in the crate. If the puppy must eliminate, it does not matter how small the area is; the puppy will have to eliminate. If the pup must be left for long periods during which it might eliminate, it should be confined to a larger area such as a dog-proof room or pen, with paper left down for elimination. As the puppy gets older, its control increases and it can be left longer in its crate. "A crate is not an excuse to ignore the dog!" Although there is a great deal of individual variability, many puppies can control themselves through the night by 3 months of age. During the daytime, once the puppy has relieved itself, a 2-month old puppy may have up to 3 hours control, a 3-month puppy up to 4 hours, and a 4- month old puppy up to 5 hours. What is the best technique for crate training older pets and adult dogs? For adult dogs or older puppies that have not been crate trained previously, set up the crate in the dog's feeding area with the door open for a few days. Place food, treats, and water in the crate so that the dog enters the crate on its own. Another alternative is to place the crate (or a second crate) in the dog's sleeping area with its bedding. Once the dog is regularly entering the crate freely, it is time to close the door for very short periods of time. Using the same training techniques as for 'sit' and 'stay' training, have the dog enter its crate for short periods of time to obtain food, treats, or chew toys. Once the pet expects treats each time it enters the crate, train the dog to enter the crate on command (e.g. kennel! ), and have the dog remain in the kennel for progressively longer periods of time before the dog is allowed to exit. Give small rewards each time the dog enters the cage at first, and give the dog a favored chew toy or some food to help make the stay more enjoyable. At first, the door can remain open during these training sessions. An occasional dog may not tolerate crate training, and may continue to show anxiety or even eliminate when confined. These dogs may adapt better to other types of confinement such as a pen, dog run, small room, or barricaded area (e.g. using a child gate). Of course, if the dog is being left alone for longer than it can control (hold in) its elimination, it will be necessary to provide an area much larger than a cage, so that the pet has a location on which to eliminate, away from its food and bedding. Continued anxiety, destruction or vocalization when placed in the crate may indicate separation anxiety. The intervention of a behaviorist may be needed.